The first impressions for PES 2017 were released this morning and things certainly look very promising for the year ahead. - Current demo features four licensed teams: Atlético Madrid, Arsenal, France and Germany. - PES 2017 will launch alongside a Day One transfer update, with weekly player stat updates to follow for online and offline users. - Lots of new-and-improved player faces - even Arsenal's Jeff Reine-Adélaïde, who's yet to make a league appearance for the Gunners, has been done! - According to Digital Spy, Konami are able to include up to 4 Bundesliga clubs this year. It's worth reminding that only 3 German sides featured in PES 2016: Bayern, Mönchengladbach and Wolfsburg. - A brand new player ability stat has been added to help differentiate between player balance (Mesut Özil) and player strength (Olivier Giroud). Digital Spy: "Over use any player or goal route too much – out wide to the annoyingly speedy overlapping Arsenal winger Theo Walcott, for example – the computer-controlled defenders will shift to compensate, doubling up to stop you being so damn lazy." Eurogamer: "Likenesses have been improved, more players have been uniquely modelled and it's as handsome as ever." Games Radar: "It features the best of everything you loved about PS2 era PES – swift, almost effortless passing; a sense of variety and achievement in every goal; true player individuality; a magic you can’t quite put into words." GameSpot: "Goalkeepers seem to have undergone several key improvements. They react much more quickly to shots, positioning themselves more intelligently before the ball is fired towards them, and get up off of the floor with more urgency if the ball is still in play after their initial save. Keeper quality, or lack thereof, was one of the major disappointments with PES 2016, so it's nice to see the problem being addressed." GodisaGeek: "The game is still in development, but there’s a huge chance PES 17 will be the best football game for a second year on the trot." IGN UK: "The new game feels immediately a little smarter, seemingly better at reading the power meter on passes, evaluating not just how hard I want to hit the ball, but why I’d be hitting it that hard in the first place." International Business Times: "For PES 2017, Konami is promising a day one update that will include the most up-to-date squads and weekly updates thereafter for both offline and online play." PESFan: "It’s all change on the condition arrow colour front. The upward arrow denoting highest form is blue, then comes green (second highest). Yellow is now the mid-point with orange (second lowest) and red (lowest) denoting poor conditions." PlayStation Acccess: Video interview with Adam Bhatti. Red Bull: "A day one patch will be rolled out which makes sure players who've been recently transferred in real life are part of the correct roster within the game, and this is to be followed by weekly updates to a player's ability throughout the season." Squawka: "PES 2017’s shooting has become more unpredictable, which again creates a more lifelike experience. We rapidly had to unlearn certain situations which were previously guaranteed goals, with some of those shots now skewing wide of the post. The enhanced player and ball physics eliminate such telegraphed efforts, while adding suitable venom to powerful, mid-range shots." The Sixth Axis: "It’s more fluid, it’s more natural and it’s taking a number of steps forward from what should be considered one of the best football games around." Trusted Reviews: "PES 2016 is an excellent game of football, so it’s fitting that PES 2017 presents a refinement rather than an overhaul. Gameplay offers more animations, adding a further layer of realism as players control, pass and move in more ways than ever before." Videogamer: "Last year's PES was a masterclass in attacking football. This year, it's the defences which are coming out on top." 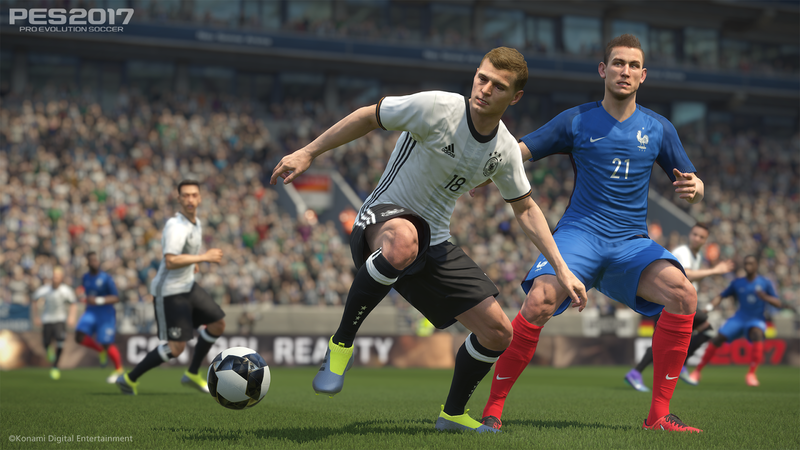 Winning Eleven Blog: "Although PES 2017 does not appear to have changed significantly compared to its older brother, the improvements deliver a more satisfying and representative sports game."